Our seed-starting system leaves much to be desired, but we have made it work with what we have available. 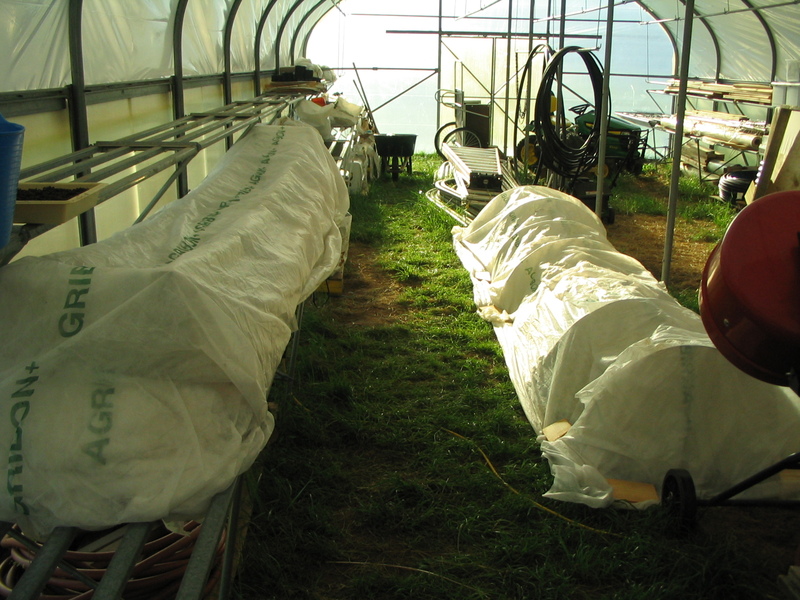 We are germinating the seeds in the yurt on the light bay, and when they are ready to grow into larger soil blocks, we move them to the greenhouse. The greenhouse is unheated right now. The opposite end (not in this picture) is open to the weather so we can move the tractor in and out, keeping it under cover. 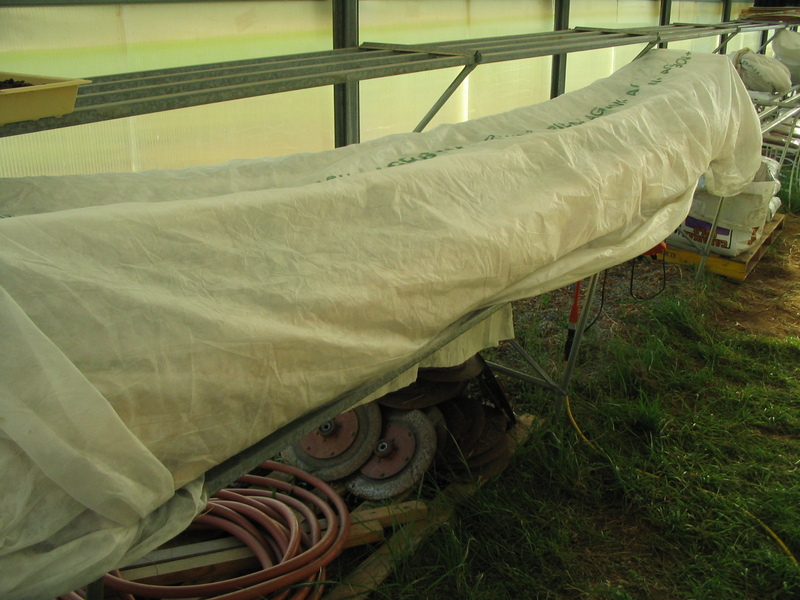 So the plants have little protection against the cold: maybe a degree or two on a non-windy night. Our first succession of cold-hardy plants got blasted with frost one night, but they have since recovered and are now growing well under cover in the field. 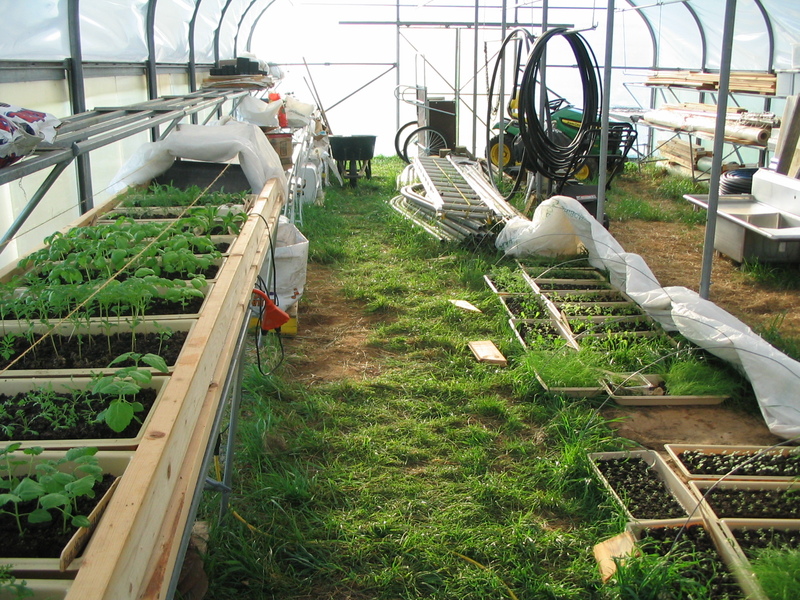 After that experience Gavin built a little heated chamber for the more cold-sensitive plants, and we moved the other trays to the ground where they benefit from the mass of the earth as opposed to sitting up on the benches. We have to cover and uncover them every night/day. Someday this greenhouse will not also be serving as a barn, and it will be fully enclosed and heated! The covered heat chamber stays pretty warm even when the temps dip into the 20s. 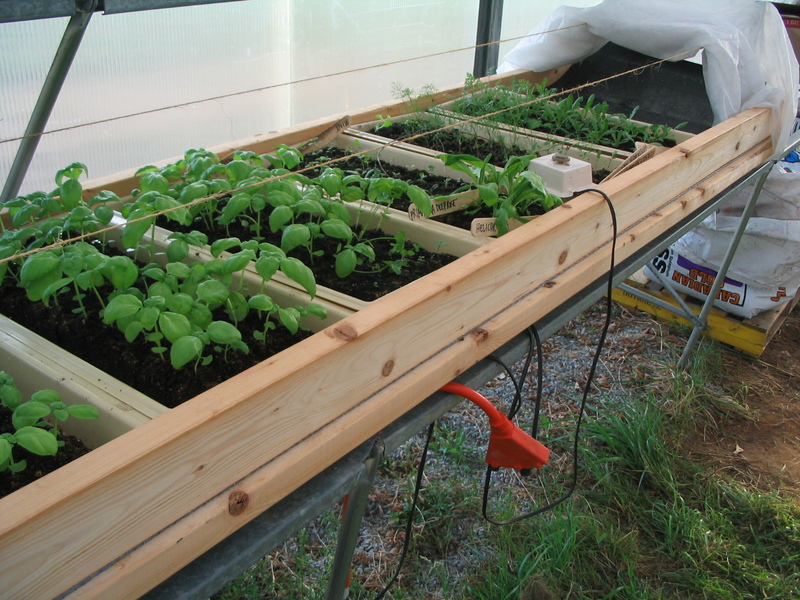 Gavin set a layer of foil-covered bubble wrap on the bench, the heat mat over that, enclosed the sides with 2x4s, rigged up strings to keep the row-cover off the plants, and voila: a mini-greenhouse. These herbs have done well in the heat chamber. A little show of Gavin’s ingenuity! The plants look great but what a lot of work! Today’s weather was a farmer’s dream, wasn’t it? Hope we don’t have many more low temp nights. Unfortunately the 80 degree, sunny weather was not so great for us here… because of the wind. The combination of wind and sun has really dried out the soil and beat up all the plants; not good for everything we just put in the ground last week. Luckily it rained some last night… but today more wind!